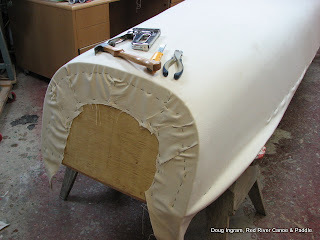 After the hull is faired and has the linseed oil applied, its time to canvas. 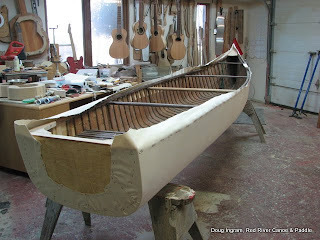 With the Full transom on this canoe, the piece of canvas that I have isn't long enough to sling up like a hammock like I usually do, so I had to do it bottom side up. Some people prefer to do it this way all the time. 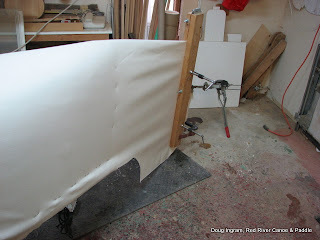 The canvas is folded over the transom and secured. This will also get filler, and the whole area will be covered by a plywood transom cap. This is all that I can get done this week, the filler will have to wait till after Thanksgiving.